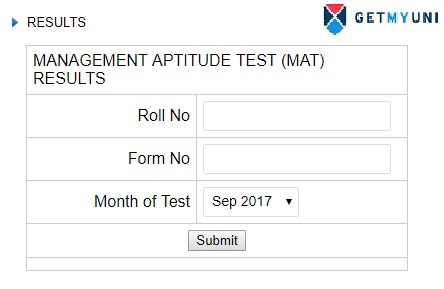 Enter your MAT roll Number, form number and month of test, click on submit button. 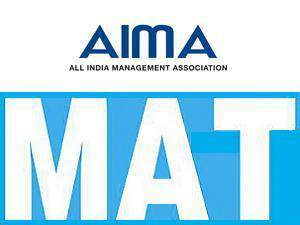 Result Availability: MAT results 2019 or scorecard will be published on the official website of AIMA or candidates can make use of the link provided below to check their result. MAT 2019 Result Date: The MAT May results Will be announced on 10th June 2019. Mode of Result/Scorecard: No scorecard will be sent to the candidates via post. Results can only be seen online or via SMS. Printout of Results: Candidates are advised to take a printout of the result for reference and future use. MAT 2019 counselling: The counselling process will begin after the declaration of results. 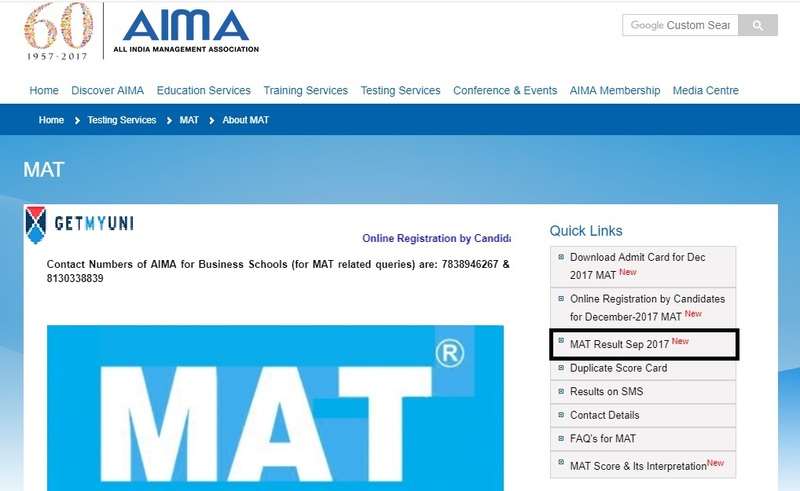 Step 1: You must go to the official website of AIMA for MAT 2019 result or students can make use of the link mentioned below to check their MAT 2019 May Result. Step 3: After clicking on the results you will be directed to a page where you have to enter your credentials such as Roll No, Form No, and Month of test to get the results for MAT 2019. After entering all the credentials click on the Submit. Step 1: MAT Candidates can also get their MAT 2019 exam results through SMS. Step 2: The candidates are required to enter their Application Number and DOB (date of birth) by prefixing MATS (in caps) and send it to 54242. Validity: MAT 2019 score and result will be valid for one year only. Merit List: MAT 2019 merit list is prepared based on the score obtained in the exam. The merit list will be updated only after the MAT 2019 results are announced. Future reference: Candidates are advised to keep a printout of their MAT 2019 results and scorecards for further reference during the admission procedure that will follow. Scorecard submission: Candidates are required to submit their MAT 2019 scorecard while applying for admission to various B-schools. The candidates need to write a letter on a plain paper as an application to AIMA urging them to provide MAT 2019 exam scorecard. Candidates seeking duplicate MAT 2019 scorecard need to attach the photocopy of the lower half of the MAT 2019 Admit Card, with the application. Size 24 cm x 12 cm (approximate). Your address in capital letters. Postage stamp of INR 40 affixed to Speed Post and send it to the AIMA, New Delhi. 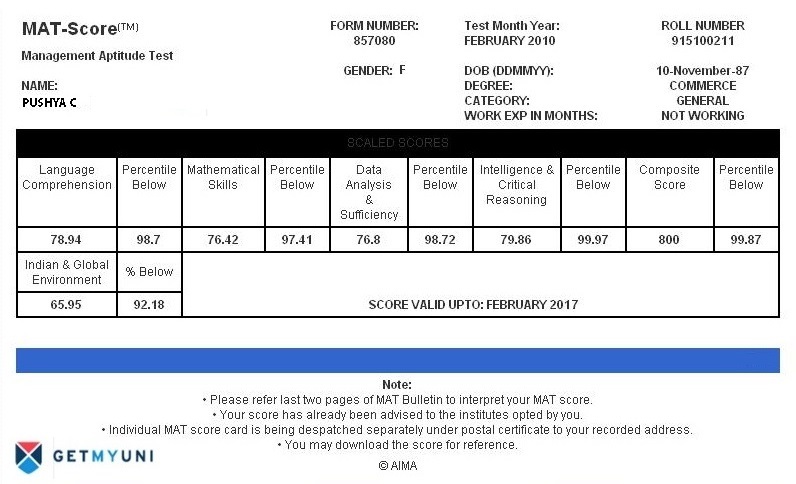 How is MAT Results 2019 Score Calculated? Since MAT is conducted in multiple slots, the difficulty level might vary. AIMA provides the total scaled score. Each MAT score card will state the scores secured by candidates in all the six sections of the exam: Language Comprehension, Mathematical Skills, Data Analysis & Sufficiency, Intelligence & Critical Reasoning, Composite Score and Indian & Global Environment. The composite score is computed using the first four sections. Equal weightage is assigned to all these sections. Language Comprehension, Mathematical Skills, Data Analysis & Sufficiency and Intelligence & Critical Reasoning are reported from scales ranging from 0 to 100. Scales below 20 or above 80 are rare. The Composite Score is reported on a scale of 199 to 801, but extreme scores below 200 or above 800 are not common. The uncommon scores, i.e. below 200 are reported as 199 and all above 800 are reported as 801. Indian and Global Environment score is separately reported on a scale of 0 to 100. According to AIMA, scores less than 20 and 80 are quite rare. The scorecards of the MAT 2017 exam will be published within a month after Conduction of the MAT exam on the official Website of AIMA. Where can I find my MAT results? 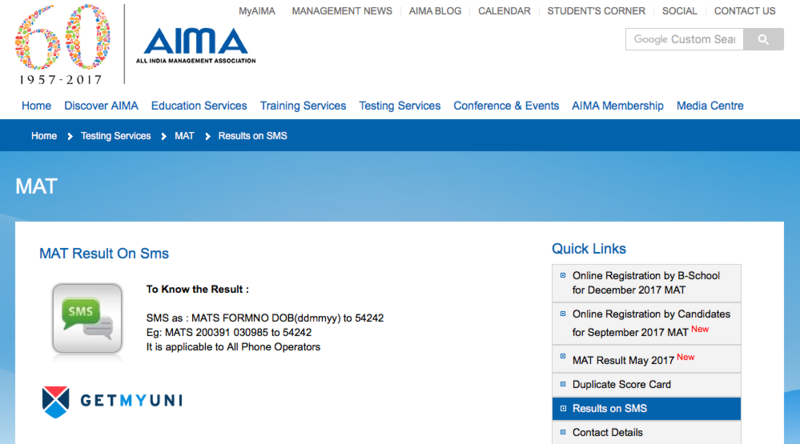 You can find your MAT results on their official website https://apps.aima.in/mat_input_result.aspx. You need to provide your Roll number, Application Form number and the Month of Examination. What is the validity of scorecard of MAT results? The scorecard for MAT is valid for one year. For example, the scorecard for MAT exam held in the month of May 2016 is valid till May 2017. Will the MAT scorecard be sent to us by post? No, the MAT scorecard will not be sent via post to the candidates. Will the MAT results be sent to us by mail? The MAT results can be downloaded from the official website. The results can also be obtained via SMS by sending an SMS to 54242. May I know what is the validity of MAT 2017 score? The validity of the MAT 2017 score is for that particular session for most MI’s is one year. Where can i find MAT results? When will the results be declared for MAT 2017? The MAT 2017 result will be published within a month after conducting MAT exam. The Results will be available on the Official Website of AIMA. How long will the MAT score card be valid? The MAT 2017 score card will be valid for the duration of one year after the declaration of the results. How to get MAT Score Card? Go to the official page of MAT.